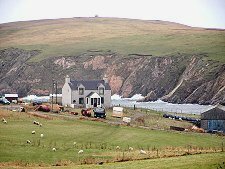 It's all too easy to think of Yell as being the largely uninhabited peat blanket carrying the excellent road from the Mainland ferry at Ulsta to the Unst ferry at Gutcher. This overlooks some of the best that the island has to offer. It is particularly worth making time to travel north from Gutcher up Yell's east coast. This brings you to a scattered community that spreads out around Yell's north eastern corner, part of which includes the village of Cullivoe. 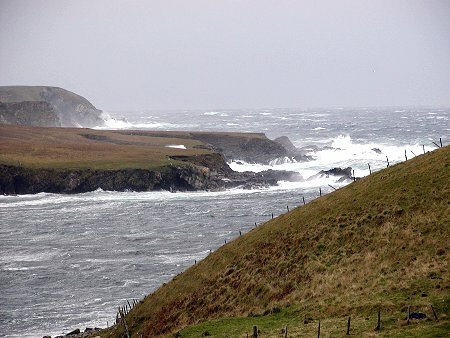 Cullivoe overlooks the sheltered Bluemull Sound between Yell and Unst and has been a long standing focus of the local herring industry. 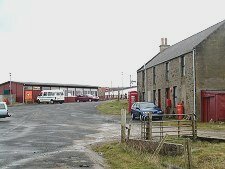 For many years it was the main terminus for the passenger ferry linking Yell with Unst, but this later migrated south to Gutcher before being replaced by the roll-on-roll-off service from Gutcher. A new harbour was built at Cullivoe in 1991 and this remains the most active port on the island. 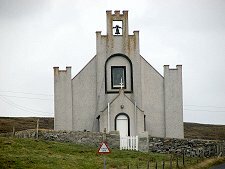 A little inland, where the harbour road meets the main road north and south, is St Olaf's Church, built in 1830. The road north turns west near the settlements of Houlland and Breckon. The attractive Sands of Breckon comprise a white shell beach in a location sheltered from all but northerly winds. Here, too, are rare flowers and evidence of Viking and earlier occupation. An even more minor single track road leads the two miles west to Gloup. Gloup is well worth a visit to view the fishermen's memorial. 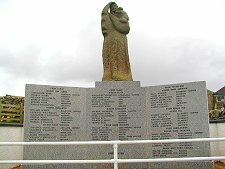 This was erected in 1981 to commemorate the centenary of a disaster on 21 July 1881 when a sudden storm overwhelmed the fishing fleet at sea. Ten boats were lost, including six from Gloup, mostly sixerns, boats propelled by six oarsmen. In all, 58 men were lost, effectively wiping out the male population of the area. Among those drowned six men with the surname "Moars", one being David Moar, the husband of May Moar who in 1858 had become famous for saving the crew of a fishing boat. And if you catch Gloup on a day like the one illustrated at the top of this page, it takes little imagination to understand how vulnerable open rowing boats must have been when the weather suddenly turned nasty. 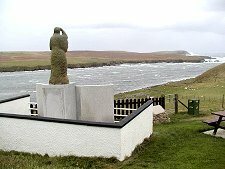 From the memorial you can walk alongside the steep-sided Gloup Voe to its head and then across country west to the remains of the iron age fort at Burgi Geos on the west coast of the island. The really adventurous can walk north from Burgi Geos to the remains of the house at Vigon, abandoned as too remote in the 1880s. Back down the coast at Gutcher you find an attractive little harbour and the ferry terminus overlooked by the Post Office, which also serves as a B&B. 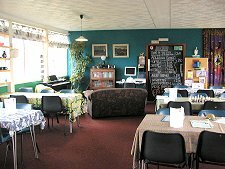 Opposite you will find both the waiting room for the ferry and the excellent Wind Dog Cafe, a source of food and drink for hungry and thirsty travellers either waiting for the ferry or setting out on an exploration of Yell.